Your Lana’i adventure starts here! Aloha and welcome to Lana’i, the small yet spunky Hawaiian island full of charm, gorgeous natural beauty and unique nuances that make it one of those places you just have to visit during your lifetime. With a resident population of just over 3,000, Lana’i is the perfect retreat escape. Here you can hide away from the hustle and bustle of everyday life, avoid the tourist traps offered on the bigger islands and appreciate tranquil days and nights interrupted only by the occasionally bird call or gentle rainfall. Lana’i is largely undeveloped, except for two spectacular resorts and two breathtaking championship golf courses. If you want an exclusive island experience, Lana’i is the place. This island is perfectly suited for those seeking untouched natural beauty, with or without creature comforts and luxurious amenities. The unpaved roads of Lanai beckon adventurers of all sorts. Great for those seeking an adventurous vacation. With less than 30 miles of paved road, and hundreds of miles of dirt roads, The island of Lana’i offers some of the most incredible scenery in all of Hawaii, and our Hummer H2’s allow you to see it in the most incredible off-road vehicle ever built. 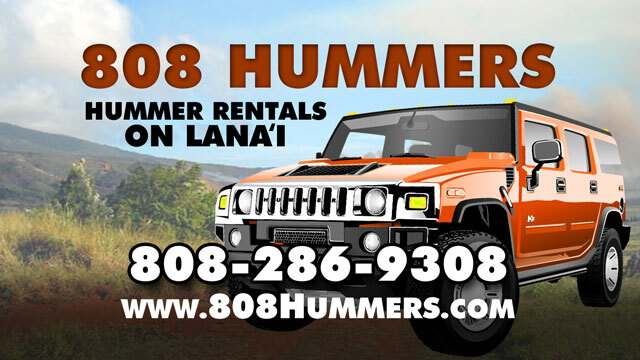 To see Lana’i the way it should be seen, reserve your Hummer H2 now….Get your Lana’i Hummer Rentals at 808 Hummers!